Here is a beautiful song soulfully and powerfully sung by the great jazz singer Jimmy Scott. 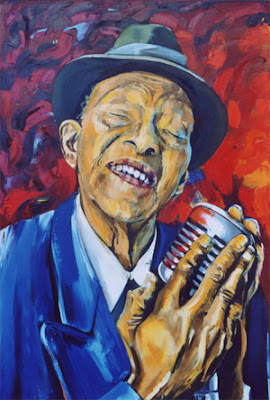 Jimmy Scott (born in 1925 in Cleveland, Ohio - 2014) had, at an early age, a health problem, that left him with a high, undeveloped soprano voice, hence his nickname "Little" Jimmy Scott. However it was his extraordinary phrasing and romantic feeling that made him a favorite singer of fellow artists like Billie Holiday, Ray Charles, Dinah Washington and Nancy Wilson. As a child he got his first singing experience by his mother's side at the family piano, and later, in church choir. Scott first rose to national prominence as "Little Jimmy Scott" in the Lionel Hampton Band when he sang lead on the late 1940's hit "Everybody's Somebody's Fool". In 1963, signed to Ray Charles's Tangerine label, he recorded, under the supervision of the great man himself, one of the great jazz vocal albums of all time, "Falling in Love is Wonderful". The record was yanked from the shelves in a matter of days. After a career eclipse, he resurfaced in 1991 when he sang at the funeral of his long-time friend Doc Pomus. Afterwards Lou Reed recruited him to sing back-up on the track "Power and Glory" on his 1992 album "Magic and Loss", partially inspired by Pomus' death. Afterwards, Scott was seen on the series finale of David Lynch's show "Twin Peaks", singing "Sycamore Trees". He was featured on the soundtrack of the follow-up film "Fire Walk With Me". This brought him to the attention of the music industry and he has enjoyed significant success since then, singing and recording.